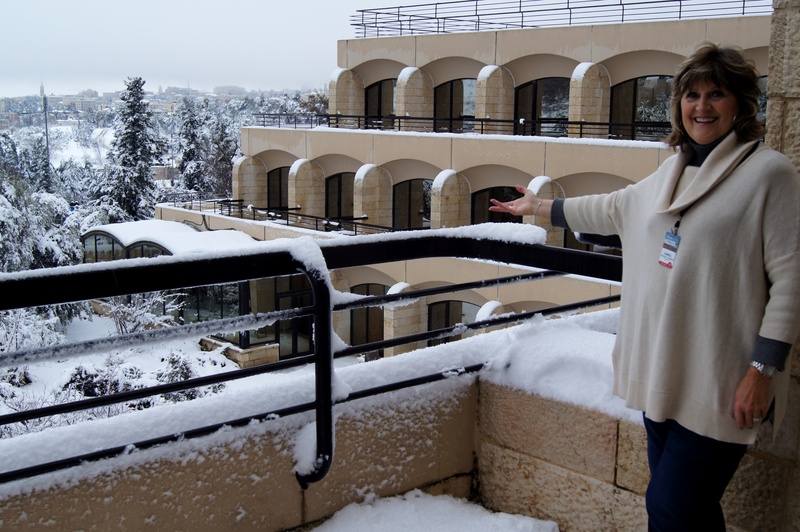 Ten inches of snow fell in Jerusalem overnight. I wakened about 4 am and looked out our hotel window to see snow resting on tree branches and stacked on our balcony railings. Jerusalem looked like a winter wonderland. Roads were closed all over the city and priority is getting the road to the airport open. Our thirty-one congenial travelers are enjoying learning to know each other. 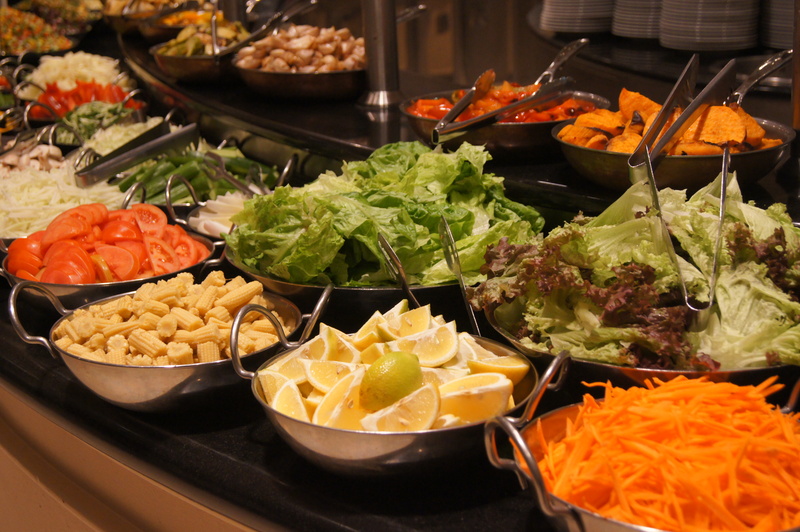 Meal buffets at the Dan Jerusalem are amazing. Choices are varied and extensive and we are learning a bit about kosher laws i.e. no dairy along with meat. Heard of a traveler who smuggled in a small packet of creamer for her coffee, only to have a Rabbi call her out on it in the dining room. About 10 am we gathered in the piano bar. 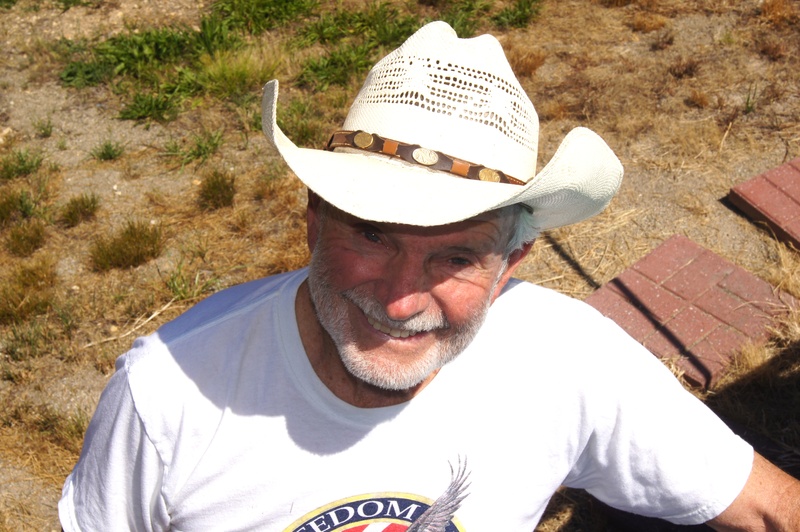 “Sparky,” one of our travelers, played “The Old Rugged Cross” and the mood was mellow. Our pastor, Rene Schlaepfer, led us in a devotional time together. At 11:20 the sun came out in all its glory, so at 12:30 we boarded our bus for a city tour. Schools were out and children and adults were playing outside. As the bus was hit by some hard snowballs, we realized there were rocks in those snowballs, older revelers hoping to break a window. We sloshed through melting snow, around Gethsemane and its olive trees, and into the Church of Gethsemane. All the restaurants Kenny wanted to take us to were closed, so we hiked up the hill to a small food stand and enjoyed the man’s offer of hot coffee, tea, and grilled cheese sandwiches. Dinner ahead tonite, Dead Sea tomorrow. What do you look forward to when you go on vacation? Is it being away from home’s day-to-day challenges? Relaxing on a beach with a sunset-hued drink topped by a little umbrella? Having cooking and cleaning done for you? Enjoying concentrated time with your partner and/or friends? Away from home, I look forward to the mental reprieve…I can put aside tension because of a disagreement with a colleague regarding his approach to mutual friends about an investment opportunity. There’s no mail to sort ’til we get home. We get STACKS of unsolicited mail every day. I think our address alone gives Veronica, our wonderful mail person, job security. And time with Don…yay, I love my man and cherish it when we have focused time together to enjoy the beauties of God’s creation, walk hand in hand, enjoy new friendships and relaxed conversations, and food that someone else has prepared. One day on our last cruise, the ship offered a myriad of scarves, ties, watches, jewelry, sunglasses, each only $10. Two other women and I shared opinions. …crawling into our own bed again, our Cavalier King Charles Spaniels on top of the comforter, cuddling in. So, who’s ready to fly fly away…and then return to our love-filled home? I am. Rancho Santa Marta (RSM) – a combination residence, school, chapel, place of education for learning disabled children. I can’t wait to see Sobeida, my precious “amigita” (little friend). Her soft brown eyes and radiant smile will greet us in church Sunday morning. This lovely 15-year-old is a talented artist, and each year I bring home a new treasure she’s drawn. Sobeida and I first became friends Sobeida four years ago. I’ve watched her shyness lessen as she has grown and matured; I’ve worked with her to decorate the chapel for missions month; and our friendship has deepened. Sobeida, her six brothers and sisters all grew up at RSM. Each has a learning disability. One of her younger sisters, 12-year-old Cassandra, hasn’t spoken for years. Last year I heard her speak–I think for the first time. Words! Cassandra is using her words! With teachers trained to work with learning disabilities, special education resources and a room that focuses on sensory responses, these children’s lives are being changed for good. While some will continue their education, others will learn practical skills like animal husbandry, which they can use to provide for themselves. The ranch is an exciting place with a broad vision. I took a very relaxing turn in the ball pool, above, which allows children to feel fully supported. Victor has severe disabilities; nearing thirty, he’ll likely never leave the ranch. But he keeps busy and productive gardening for the school and property. In addition to the forty-some resident children, many of whom have been removed from their homes because of abuse, another 120 or so are bused to school from up to 60 miles away. We’ve worked on a variety of projects there. One year I learned a Bible story in Spanish and gave a flannelgraph lesson in the classrooms. And if you remember flannelgraph you’re probably of my generation. It was a little frightening, but fun, to use my limited Spanish and see the children respond to the pictures as I did when I was little. Another team member brings her puppets; as soon as the children see Leola, it’s “Mon-key, Mon-key” (one of her puppets). Our team men, under Don’s leadership, have put up structural wall support in a dining room, helped build a water drainage system, framed a staff duplex, and installed trusses and plywood roofing on a slaughterhouse. This year the main project is installing trusses and plywood roofing on a medical/dental clinic for the residents, staff, students and community. Helen brings her hair styling tools, cuts and styles hair for the girls and staff (and sometimes, our team members). We’ll likely organize supplies, mend some clothing, and teach the children crafts. I’ll also photograph our projects and children. One day our group will divide into four groups, each of which will enjoy lunch in one of the four children’s homes, followed by a pinata party for the kids. What awaits us this year? We anticipate how God will use us to help support this ministry while Don’s and my girls (Kelly and Paige, the dogs) stay home with wonderful housesitters.